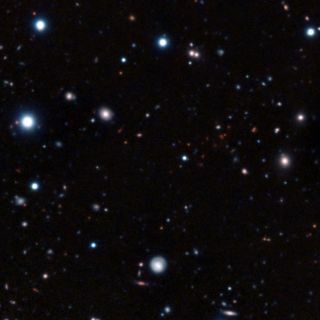 The clump of faint red objects to the right of center in this picture is the most remote mature cluster of galaxies yet found. This image is a composite of very long exposures taken with several different telescopes. Most of the visible objects are very faint and distant galaxies. Astronomers have spotted an ancient galaxy cluster that appears surprisingly young when compared to its more recently formed relatives, a new study finds. The cluster is so far away that its light takes nearly 11 billion years to reach us — meaning the cluster formed early in the universe's youth, just a few billion years after the Big Bang that created the universe 13.7 billion years ago, researchers said.. But in an unexpected twist, the galaxy cluster looks very similar to the younger, massive galaxy clusters seen in the universe today. "We have measured the distance to the most distant mature cluster of galaxies ever found," study lead author Raphael Gobat, of the Commissariat a l'Energie Atomique in Paris, said in a statement. "The surprising thing is that when we look closely at this galaxy cluster, it doesn't look young — many of the galaxies have settled down and don't resemble the usual star-forming galaxies seen in the early universe." Older, even more distant clusters have been seen before, but those appear to be young structures in the process of formation and are not settled, mature systems, researchers said. Galaxy clusters — groupings of hundreds of individual galaxies — are the largest structures in the universe bound together by gravity. Astronomers expect clusters to grow through time, and as a result predict that massive clusters should be rare in the early universe, researchers said. Gobat and his international team used instruments on the European Southern Observatory's Very Large Telescope (VLT), at the Paranal Observatory in Chile, to measure the distances to some of the objects in a curious patch of faint, red bodies, which had first been observed with NASA's Spitzer Space Telescope. This grouping of objects, named CL J1449+0856, had all the hallmarks of being a very remote galaxy cluster, researchers said. That means telescopes are capturing CL J1449+0856 as it was when the universe was about 3 billion years old — less than one quarter of its current age. Gobat and his colleagues published their results in a recent issue of the journal Astronomy & Astrophysics. Once the researchers knew the distance to the cluster, they looked carefully at its component galaxies using NASA's Hubble Space Telescope and ground-based telescopes, including the VLT. This image from the Hubble Space Telescope shows CL J1449+0856, the most distant mature cluster of galaxies found. The image was taken in infrared light, with color data added from ESO’s Very Large Telescope and the NAOJ’s Subaru Telescope. They found evidence suggesting that most of the galaxies in the cluster were not forming stars, but were composed of stars that were already about 1 billion years old. This makes the cluster a mature object, similar in mass to the Virgo Cluster, the nearest rich galaxy cluster to the Milky Way, researchers said. The team also studied X-rays coming from CL J1449+0856, using the European Space Agency's XMM-Newton space observatory. Researchers found that the X-rays are coming from a very hot cloud of gas that fills the space between the cluster's galaxies and is concentrated toward the cluster's center. This X-ray production pattern provides further evidence that CL J1449+0856 is a mature galaxy cluster, held firmly together by its own gravity, researchers said. Very young clusters have not had time to trap hot gas in this way. All up, the study shows that the faraway cluster is quite well-developed despite the fact that it was around when the universe was still relatively young. And that makes it special, researchers said. "These new results support the idea that mature clusters existed when the universe was less than one quarter of its current age," Gobat said. "Such clusters are expected to be very rare according to current theory, and we have been very lucky to spot one. But if further observations find many more, then this may mean that our understanding of the early universe needs to be revised."